Akkarai S Swamynathan was born on 6th November 1952 in Tirunelveli, Tamil Nadu. He is the son and disciple of Suchindram Shri S P Sivasubramaniam, a multifaceted Carnatic vocalist and violinist, as well as composer and teacher. His mother, Smt R Sornambal was a music teacher and exponent in Harikatha (musical discourses relating stories from India’s scriptures). 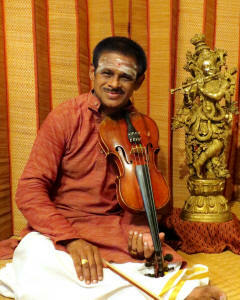 Blessed with such parents who lived and breathed music, Swamynathan began his violin training under his father at a young age, and by his teens, he was accompanying several artistes and performing with his parents at their Harikatha concerts. In July 1979, Swamynathan married A Janaghi and settled in Chennai. There, he began a career at the Indian Bank, and also simultaneously established a music school named ‘Swara Raga Sudha’ and imparted musical training to numerous students. Moving to Delhi in 1990 did not dampen his passion for music. He continued to teach students, and also began to train his daughters, Subhalakshmi and Sornalatha, devoting innumerable hours to disciplining their practice, shaping their style, and inculcating values in them. 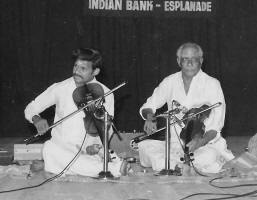 Despite the fact that Carnatic music concerts and opportunities were few and far between in Delhi, Swamynathan provided them with a rich musical environment at home and devised unique practice methods to build their accompanying skills. 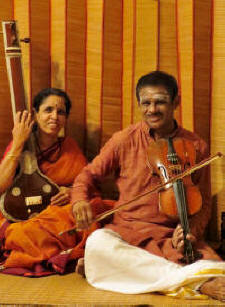 His steadfast commitment, dedication, and perseverance enabled Subhalakshmi and Sornalatha to become the globally renowned musicians they are today. Swamynathan has performed all over India. He has toured to Andaman with legendary ghatam artiste Shri T H ‘Vikku’ Vinayakaram, as well as Poland and Russia with eminent Bharatanatyam dancer Yamini Krishnamurthy. He has also played numerous duets with his father Shri S P Sivasubramaniam, and duets and trios with his daughters Subhalakshmi and Sornalatha. 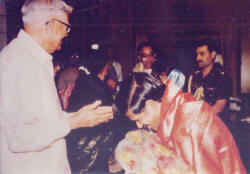 Amongst many awards and honours, Swamynathan was felicitated by the President of India Shri R Venkataraman following a performance at the Rashtrapati Bhavan, and was awarded the Roll of Honour by Sadguru Gnananda Sangeet Sammelan and Narada Gana Sabha, Chennai, in 2016 and Acharya Rathnakara at the Cleveland Tyagaraja Aradhana in 2018. Swamynathan chose to forego a career in music so that he could devote himself towards training his daughters. In 1998, Subhalakshmi performed in Chennai, the capital for Carnatic music, and took the music world by storm. The family subsequently moved to Chennai, foreseeing a bright future there for Subhalakshmi and Sornalatha. Swamynathan retired from the Indian Bank as bank manager (Tindivanam branch) in May 2012, and he now works as a financial consultant for Max Life Insurance. He continues to tirelessly devote himself to his passion of imparting musical knowledge to the next generation.